Bill Kopp: There’s something special about having Turtles music on vinyl. Just last year, FloEdCo reissued the Happy Together and It Ain’t Me, Babe albums on vinyl, and now there’s this set of 45s. After years of not having control over reissues, and seeing haphazard collections of your music coming out, how does it feel to be able to, shall we say, set things right? Mark Volman: Well, of course that’s always been on our minds. There were so many outside deals that had been negotiated. We needed to clean up everything, and it took a long time. I would guess that some of the deals had to be attacked a lot more than others; some just had to kind of run out. But ultimately, to do things right, we wanted to get everything in-house. And that took a whole lot of years. Mark: Yeah. 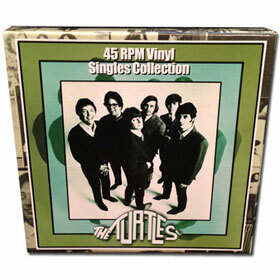 And we wanted to include the “Turtles on 45” spindle in case people needed it. Everything about it was nearly done, and we got to the point where it’s going to be made available internationally. We’re really excited about it, though I don’t expect it to sell more than three, four, maybe five thousand copies. For the last two years, we took a prototype of this package out on tour with us, and sold them. And those limited edition ones were in a little different package, and they were sold on our Happy Together tours. This upcoming summer, the fifty cities that we’ll hit, we’ll take out this new version. There’s a diehard fan base that stays with us through the years, and they just love it when we put together this kind of thing. Bill: The one thing – and this isn’t a criticism, it’s a question – is that you didn’t include a set of liner notes, a booklet or anything. I wonder if that was a missed opportunity. Mark: I think that The Turtles history is pretty intact online. If someone wanted to go online, they could read all about it. And every greatest-hits album that we’ve put out has had a little blurb or something. What we really did here was just focus on the records coming out. We weren’t really trying to reach a new audience as much as we were providing a new version for the older audience. We didn’t want to do a booklet; we had our choice: we could have done six 45s and a booklet, or eight 45s. We felt it was more important to put the songs in there. And so rather than treat it like it was history, we presented it like it was new. Bill: Are there any plans to reissue other Turtles music on vinyl? Maybe my favorite of The Turtles’ albums, The Turtles Present the Battle of the Bands?